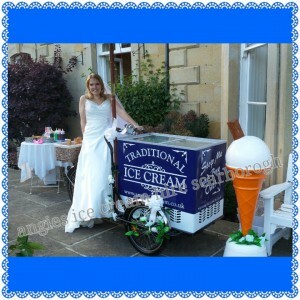 STUNNING ICE CREAM TRICYCLE HIRE AVAILABLE FOR ALL EVENTS WEDDINGS A SPECIALITY . 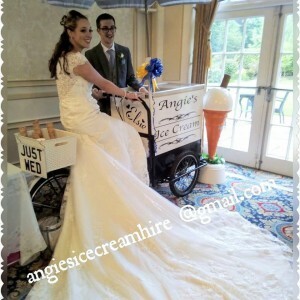 Ice cream is my passion not just my job so all our ice cream Tricycles for hire are genuine they are not cheap copies, each one proffesionally made to the highest standard fully fitted with temperature controle to store the ice cream at the perfect temperature & consistancy, which is why we have been awarded the highest 5* hygiene certificate an every Tricycle has been PAT tested. 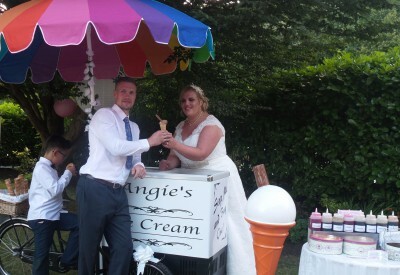 Weddings - Birthdays - Galas - Charities - Sports days - Corporate - TV/Film - Promotions - Advertising - Open days - Funeral teas - Fetes - Carehomes. 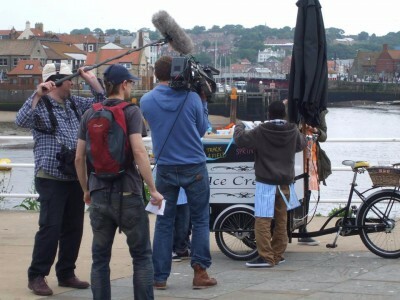 Elsie has been such a big hit, appearing on TV and attending special occasions. 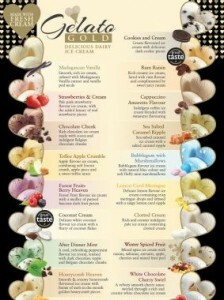 Serving only the very best luxurious award winning, free range real dairy clotted cream ice cream for weddings, we also supply none dairy, diabetic & sorbets. 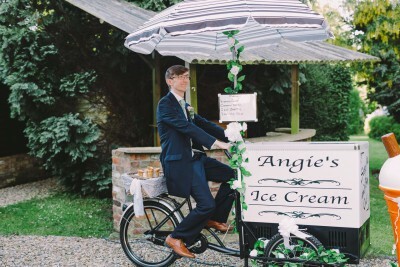 Our stunning vintage ice cream bike Elsie is a traditional Pashley style "STOP ME & BUY ONE" 1940's ice cream bike serving only the very best ice cream the way it used to be in the good old days. 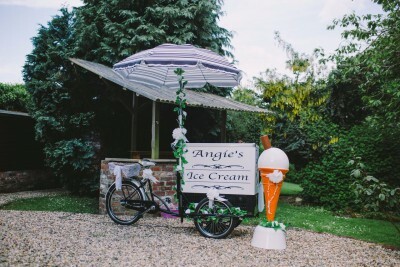 Elsie is our beautiful unique black & white trike & can be positioned indoor or out weather permitting, what better way to thank all your guests. Betty our stunning "something blue" is also totally unique to us as we designed & chose the pattern & colour of all our trikes. 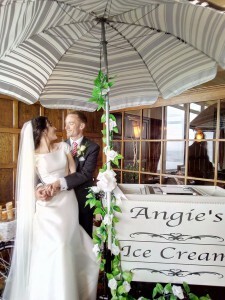 If you would like to turn back time and add something extra special to compliment your event for all to enjoy and remember, Elsie would be more than happy to attend. 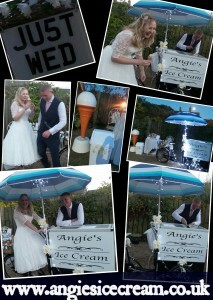 Wedding package fully inclusive of everything below no extra cost! For a free no obligation quote please email or fill in the enquiry form thank you. 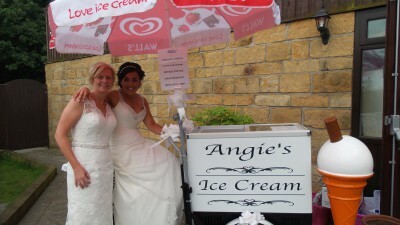 We only serve the very best award winning luxury ice cream at weddings freshly made for you just before your event, we never ever serve cheap cash & carry ice cream like most companies. 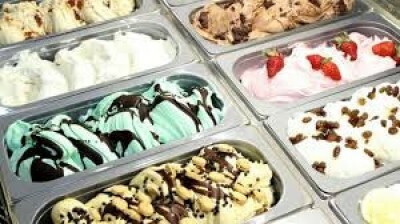 AWARD WINNING LUXURY GELATO PRODUCED IN A NUT FREE ENVIRONMENT, SORBET, DAIRY FREE & DIABETIC, ALSO AVAILABLE. Please note we do not charge charty events and will gladly donate a percentage of our takings too. 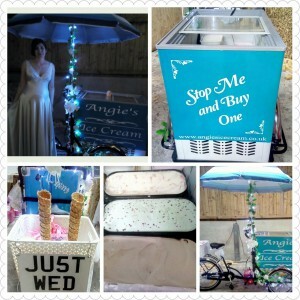 TV/Film hire - we can provide empty as a prop or with a selection of flavours or even pretend ice creams that do not melt!